Whew! We made it to Friday. 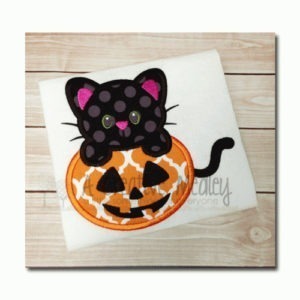 This week the brand new Gobble til You Wobble narrowly won the poll in the Facebook Group over the newly updated Pumpkin Kitty applique. 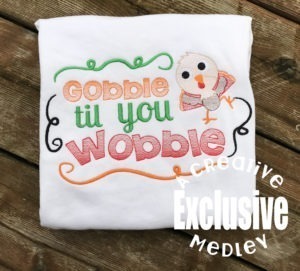 Add the Gobble til you Wobble design to your cart along with any other (not free) design and a coupon will appear at checkout. Click the coupon to apply it. Both the Gobble design and the purchased design must be in your cart for the coupon to appear. If the design is not in your cart at checkout, it will not appear in your account. The freebie expires at midnight US Central time on Saturday, October 14, 2017 – but grab it now before you forget! There were a few minor changes within the design to bring it up to my current standards, just to make it stitch a tiny bit more smoothly. There was also a small change to how the eyes stitch. If you previously purchased the design, you can either reply to the receipt you received when you bought it, reply to your Paypal receipt or send a message through the Contact Us form on the website with the name and email you purchased it under so that I can look up your receipt. I will respond with the updated file. You do not need to re-purchase to get the update. Stitch it, cut it or buy it! My birthday is coming and I’m throwing a party! I admit it, I love my birthday. I like to pick whatever I like for dinner (that is our family tradition) and just celebrate another year on this planet. This year is a big one – I’m turning 40! Nope, not 39 for the second time, 40. I will start my summer sale on my birthday – August 11 – but I want to start the fun NOW. The good news is, this is my shop and I’m the boss – so I get to do it! I have written up 40 coupons for my 40th. Most are only good for ONE use, so if you see it, grab it – it will be gone fast. I will add 4 each day between now and the 10th, spread out at different times so that different time zones all get a chance. If there are any unclaimed by the 11th, I’ll post a list. Happy Hunting! It is Friday again and that means it is time for another Freebie! It has become tradition, each Friday I post a different design free with any purchase (with a few exceptions during sales, etc). 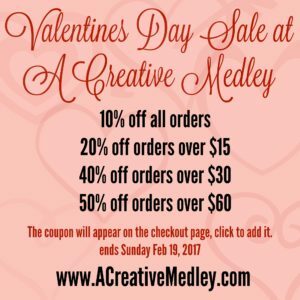 This allows me to give you a great deal on some of my best designs or new releases. 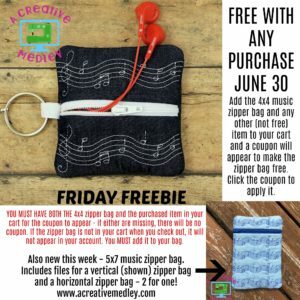 Make sure you grab it while you can – Friday Freebies expire Saturday night – so the 4×4 zipper bag will go back to regular price at Midnight on June 31, 2017. 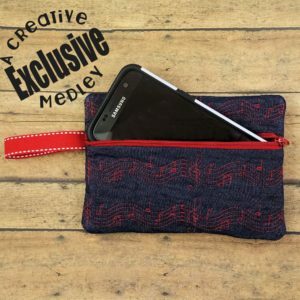 This week, the brand new 4×4 zipper bag with music motif is our Freebie. 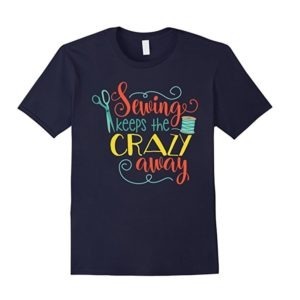 Add the zipper bag, along with any other (not free) design and a coupon will appear in your cart. Click that coupon to apply it and it will remove the cost of the zipper bag. You must have both in your cart for the coupon to appear. 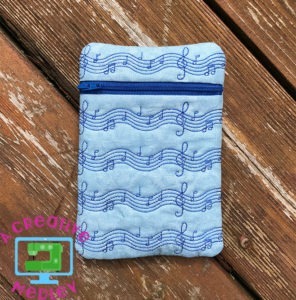 I also listed the 5×7 zipper bag with music motif this week. It includes designs to make both a horizontal wristlet style zipper bag AND a vertical cross body style zipper bag – 2 designs for the price of one. Really, if you buy the 5×7, and get the 4×4 freebie, you will get three for the price of one! 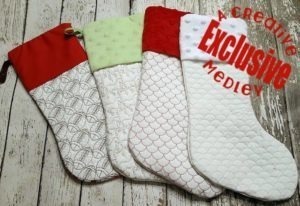 I have over 20 motifs between the stockings and bibs – which ones do you want to see next as zipper bags? Drop a note in the comments and let me know! 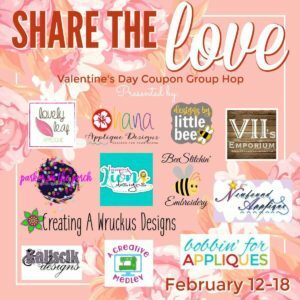 I’m back from my anniversary trip and that means Freebie Friday is back too! I’m still in a beachy state of mind with this “Life is better at the beach” design. Free with any purchase – no minimums. Add the beach design and any other (not free) design to your cart before Midnight May 27, 2017 and a coupon code will appear to make it free. Click the code to apply it and check out. You must have the design and a purchased design in your cart or the coupon will not show up. 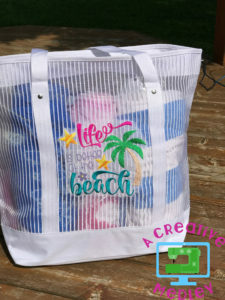 I found a nice big mesh tote at Target for just $9.99 and it is the perfect match. Next time though I’ll use this Stitch N Rinse stabilizer so that you can’t see it through the mesh. Fill up your cart and head to the checkout – the coupon will show up in your cart and all you have to do is click on it to add the coupon and claim your savings! 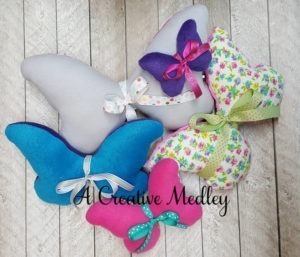 Head over to the designs at A Creative Medley and grab your goodies! If you want to save even more, join our Facebook Group for the special add-on code just for group members. Then visit the rest of our digitizing friends who are participating in the Share the Love event. Peekaboo Bunny got an upgrade! Peekaboo Bunny was the very first of the Peekaboo friends. In the two years since he was released, I have heard from a lot of you about what would make him even better, so he has had an upgrade! First, what you care most about – YES, previous purchases can get the updated version at no charge. Keep reading for the details about how. Each of the designs after the bunny have a step to tack the body fabric down before adding the face, feet, etc. This helps keep everything nice and smooth and prevents puckering and other mishaps. This has now been added to PAB bunny. I have moved the placement and tackdown stitches just a smidge. In the past, if there was any puckering, sometimes those lines showed up just a little bit on the front of the bunny. That won’t happen anymore. SATIN OUTLINES – this is the biggie that most of you have been waiting for! Yes, you can now use a full smooth satin stitch on his feet and ears, like you can on all of the others. There was one change made very quickly after the bunny was released – originally both arms stitched in one step and then both ears. On machines with a lower foot clearance, moving back and forth across the hoop like that was causing the foot to get caught and pull the project out – not fun! As soon as I understood what was happening, I switched how it stitches out and that is no longer an issue and hasn’t been since a few days after the first release. If you have a version that does this, you DEFINITELY want to grab the updated file. How do I get the updated file? I anticipate hundreds of people wanting the updated version, so I need your help to get them out as quickly as possible. If you purchased it before May 2016 OR you purchased it on Etsy, I need your help. With the site crash in May 2016, accounts were wiped out. If you need access to designs you purchased before then, please contact me and I can restore them manually, one by one – not a fast or easy process, but I am willing to do it. The fastest way to get the updated file is to find your email receipt from your original purchase and REPLY with a note that you want the updated file. If you do that, I can just reply to you with it attached. I will be working through these messages first to get the most people as quickly as I can. If you do NOT have the email receipt, you can use the Contact Us link to send me a message with the name and email address you used as well as if it was purchased on the website or Etsy. I will have to search my email to confirm purchases – not that I don’t believe you, but a few scammers ruin it for everyone 🙁 This will take me much longer, so if you have either the email or a screen shot of your purchase information, you will get your file much faster. I have a good chunk of time set aside to send out files over the next few days and will get them to you as quickly as humanly possible, please remember that I am one person helping as many as I can, as quickly as I can. I don’t have this design! Where do I get it?!? You can get your very own copy of the new and improved Peekaboo Bunny right HERE and make sure you check out the rest of his friends in the Peekaboos category. I have kids in my life who struggle with anxiety, so I am always on the lookout for calming tools. Somewhere I saw a picture of a fabric marble maze made on a sewing machine and I knew I had to figure out how to make it in the hoop, so I could make them as quickly and easily as possible. Lets back up for a second – what is a marble maze? It is simply a marble enclosed in a path between some pieces of fabric. You push on the marble through the fabric to move it through the maze. It sounds so simple, and it is! So why is it so mesmerizing? I’ll be honest, I have no clue, but it is. Julie from Crafty Pink Flamingos was kind enough to let us share her video with you. It took a little bit, but I figured out a way to make them on the embroidery machine using layers and a little bit of magic. Ok maybe not magic – just a little creativity. There is a hidden layer that keeps the marble in the path but still allows you to turn the design right side out after stitching it. It is literally 3 color stops on your embroidery machine and you don’t even have to change your thread. Finding marbles in my local stores has been hit or miss – sometimes they are everywhere: Target, Walmart, Hobby Lobby, the Dollar Store. Other times I can’t find them anywhere! I don’t bother looking anymore, I just grab THESE on Amazon and with Prime shipping they are at my door in 2 days. I offered up one of the designs free for one week only in my Facebook Group on Giving Tuesday with the one condition that they find someone to give their first one to. I was amazed by the creativity they showed. They gave them to preschools, occupational therapists, rehabilitation facilities, senior communities, therapists and more. There are files for every hoop size, so hop on over to the Marble Maze category and pick one up to try today. If you don’t have an embroidery machine but want one of these mazes, contact Julie at The Crafty Pink Flamingos and she’ll take care of you! Drop a comment below and let me know who you would give your first marble maze to! What is the best embroidery machine? Are you comfortable with watching youTube and troubleshooting or do you think you would need more support than that? The Babylock Destiny is a magnificent machine and the Viking Epic is truly epic – but they will both set you back north of $15,000. On the other end of the spectrum, a Brother SE400 (that is an affiliate link, click here to find out more) is $320 at the time of this writing. There has to be something in between those, right? A standard piece of advice is to get the biggest hoop you can afford. I would agree with that in large part. Hoop size is very important. Every embroiderer will bump into “hoop envy” at some point. Here you are, happily stitching your monograms and then someone has to put something like this in front of you and suddenly you “need” a bigger hoop. I strongly suggest that people wait until they can afford at least a 5×7 (or 13ommx180mm) hoop. The Brother PE 770 (that’s another affiliate link) is a very popular choice at this size and is usually in the range of $600. There are a few people out there who are perfectly happy with a 4×4 hoop and I take my hat off to them. The vast majority outgrow it very quickly when they realize that it is best suited to newborn items and monograms. Even a toddler shirt will look better with a 5×7 design. Many In the Hoop designs start at 5×7 because sometimes there is just no way to make it work smaller. If you can stretch your budget to a bigger hoop, you will appreciate it. Each jump in size opens more and more opportunities. Are you an independent learner, comfortable with troubleshooting via YouTube and message boards? The machines I linked to above come from Amazon or another big box retailer. 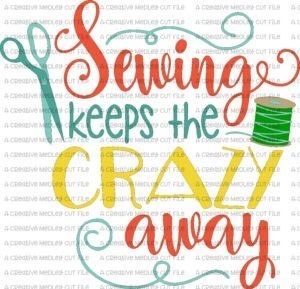 When you can’t figure out why all of a sudden you have more bobbin thread than colored thread on the top of your design, they won’t have a clue. They are not going to walk you through setting it up, threading it, choosing stabilizers and thread. Those are all things that you could expect from a good machine dealer. Most dealers will provide some classes to get you started and are there when you need a hand. Some also include free service for a year or two. That is a real value that cannot be overlooked. There are plentiful resources on the internet for learning to use your machine and tips and tricks of the trade. (Some are good, some will ruin your machine, but that is a post for another day!) If you are comfortable with seeking out solutions on your own, or if you do not have a dealer close enough to be of any help, purchasing online or from a big box retailer might be for you. As with any online purchase, be sure to know who you are buying from and what their return policies are if you get a lemon. Why can’t I find prices online!? Machines with hoops larger than 5×7 (other than Singer, but we will get to that) are generally only sold by dealers. Each dealer will have one or more brands that they sell and support. It is hard to give a price range for these machines because dealers do not advertise their prices. You must call or stop in (depending on the dealer) to see the machines firsthand and find out pricing. OK, I’m going to visit the dealer, what should I look for? Are any other classes available that are not included in the price? Do you service the machines locally or send them to a central repair location? Is that the same answer if it is a warranty repair? How long do you generally have the machine when I bring it in for routine service? Do you include any routine servicing in the price? There are no right or wrong answers to these questions, but I feel it is good to know these things up front, rather than being surprised down the road. Some brands do all servicing at a few central locations around the country, others service locally, which can make a big difference in how long it takes and what your dealer can do for you on the spot. I like to go visit, get a feel for prices, maybe pick up some brochures and then come home to research in depth. Do I want an embroidery only machine or one that is an embroidery/sewing combo machine? If you like to travel with your machine or attend sewing retreats, it is only one to move, not two separate machines. If space is an issue, that other machine can get in your way. 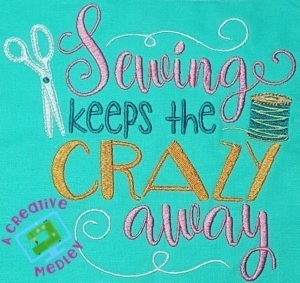 A good combo machine costs less than a good embroidery machine + a good sewing machine. Some machines now allow you to sew with the embroidery bed still attached, so there is less changing over than there used to be. What other features do I want to look for? Hoops: Maximum stitch field, which is usually referred to as hoop size is often a major factor in the decision as we discussed above. Also ask how many hoops come with the machine. Some come with a 4×4 and the largest hoop that will fit. Others include one or more of the sizes in between. Screen: These can range from a small LCD touch screen to an incredible 10.1 inch tablet like screen with lifelike colors and many steps in between. Having a color screen is definitely a nice feature. It makes it easier to see what step your design is on and the larger screens have other features. Thread trimmer: All machines will stop and trim the thread at the end of each color. Some machines will automatically trim jump threads. Those are the little threads left on top of your work when the needle has to jump from one area to another. If your machine does not trim threads, you will have to cut each one, either between colors or at the end of your project. Trimming jump threads is one of those features that those moving up to a bigger machine get VERY excited about. When the machine has to move from one area to another unconnected area, that is called a jump. Higher level machines will trim that thread between the two shoes automatically. With entry level machines, you will trim that with a scissor either between colors or after you are finished with your design. Needle Threader: As far as I know, all of the single needle machines on the market these days include a needle threader. They are NOT all created equal! Ask the dealer to demonstrate this feature for you so you can see which one you like best. On screen editing: Most machines will allow you to move the position of the design in the hoop and scale it up and down within limits and rotate in 45 or 90 degree increments. As you get into the higher level machines, some will have features that allow you to merge designs on screen, add lettering, resize, duplicate and other nifty things. The higher up you go, the less you will need software to prepare your designs before moving to the embroidery machine. Some machines even advertise that they can turn your images into an embroidery design, right on the screen. Take that one with a grain of salt, it is a rudimentary auto-digitizer, which is also a post for another day! One even lets you watch instructional videos onscreen. Built in designs: Every machine will include some number of built in designs. Some brands have exclusive deals – Babylock has Nancy Zieman designs built in and Brother has an exclusive deal with Disney. 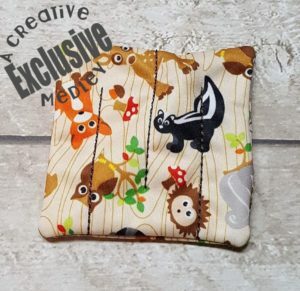 It is important to note that those designs are for personal use only, so sadly, you aren’t going to make your fortune selling Mickey burp cloths – but you can make a darn cute gift for that child in your life who is just crazy for Pooh Bear. Other than that, the included designs are nice, but they are nothing compared to the wealth of designs available to you on the internet. Personally, included designs have never been enough to sway me from one machine to another but it can be a big selling point for the Brother machines if Disney designs are important to you. They are the only legal source for Disney. 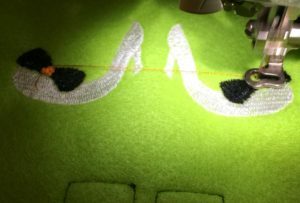 Auto tension vs manual tensions: Tension is critical in embroidery – you don’t want that white bobbin thread showing on the top of your project or loose loopy satin stitches. Some machines will have technology to automatically adjust tensions to accommodate the fabric that you are using. On the more entry level machines, the user will adjust the tension if needed. It is something that each brand will believe theirs is the best available. They are all pretty great. Lighting: The number of lights and how bright they are will vary from one machine to another. If your eyes are getting old and tired like mine, this might influence you – or you could get a great clip on light. Transferring designs to the machine: There are a few machines on the market that require that your machine be connected to a computer to run. The computer acts as the brains of the machine. Read the reviews of these machines carefully if you are considering one. They are priced quite low, but can be quite challenging for a beginner to master. Most machines will transfer files via a USB stick or by hooking up a cable between the machine and the computer to transfer the file and then the cable can be disconnected. We are just starting to see wi-fi enabled machines and I would guess that will become more common in the future. Bobbin: Like a sewing machine, an embroidery machine uses a top thread and a bobbin thread. Unlike sewing, you usually do not match the top and bottom thread. In general you will keep white thread in your bobbin. Some machines now use larger bobbins, which lets you go longer between switching out your bobbins, which is great! That comes with a tradeoff though and is worth asking about. Is the bobbin a standard size that I can pick up at my local sewing shop or is it specific to this brand or machine, meaning that I likely have to purchase from a dealer? What do the proprietary bobbins cost compared to generic? Can I use prewound bobbins? (Those are a HUGE time saver and convenience). Come on, you really don’t have a favorite? Personally, I really like the Babylock and Brother machines. I have a FANTASTIC Babylock dealer practically in my backyard who services the machines locally. The machines just make sense to me and have been SUPER reliable. Others will tout Husqvarna Viking’s bigger hoops and more features for your dollar. Janome and Pfaff are well loved by many of my customers. Bernina machines are quite expensive, but if you are a quilter, they may be your favorite brand. You may have noticed that the Singer machines didn’t come up. They are definitely the least expensive way to get a 6×10 hoop. They are also notoriously challenging. Like every brand, there are those who love them. While affordable and a great option for a slightly bigger hoop they do take a lot of patience and are not recommended for first time embroiderers. My observation over the last several years has been that the Brother PE 770 (there’s that affiliate link again) is incredibly popular with beginning embroiderers, for good reason. It is a good basic machine that does not have all the bells and whistles, but has a 5×7 hoop and stitches very nicely. It is a solid machine and a great way to find out if embroidery is your passion and worth investing in a higher end machine. Many dealers allow customers to trade in their old machines towards the purchase of a new one. They then take the older machines, tune them up and offer them for sale. Some even include a warranty. This can be a great way to get the features you want at a lower cost and still get some of those benefits of buying from a dealer. I know, you clicked on this hoping that I would tell you exactly which machine to buy and where to get it. I’m sorry that wasn’t the case, but I hope I helped you along the path to choosing the best machine for YOU.